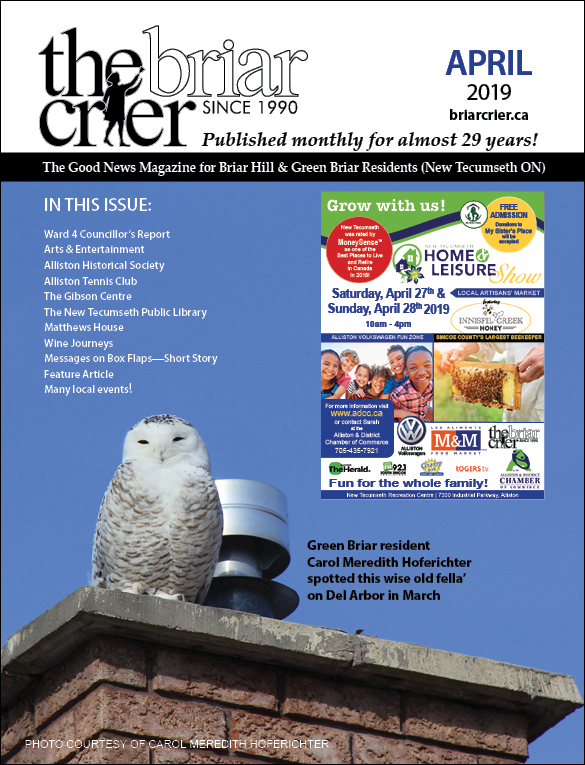 The Briar Crier™, published by Margravine Media Inc., is a community news magazine that has been delivered to readers every month for almost 28 years. The magazine is delivered to two adult lifestyle communities, Briar Hill and Green Briar, situated alongside the Nottawasaga Inn (and golf) Resort in Alliston, Ontario. At present, the magazine is delivered to approximately 2,000 locations: homes in the community, the Briar Hill Sales Office, and select organizations and businesses in the area. Briar Hill continues to be developed with approximately 60 homes added each year. Click on the cover to link to the current issue! We support many local charities and non-profit organizations in the community. We provide our readers with up-to-date information on the events and activities of many local organizations. You will find informative columns, entertaining stories, puzzles, humour, and occasionally a prize competition in the magazine. The Town of New Tecumseth and the County of South Simcoe are vibrant and growing communities. The Briar Crier will always have something new to share with you. Please check back regularly!